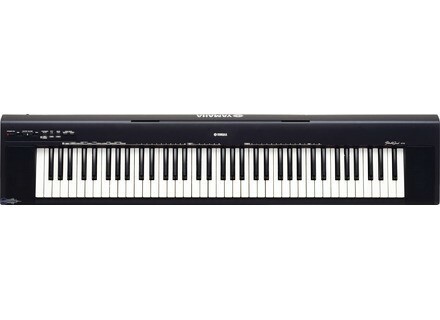 NP-30, Keyboard Arranger from Yamaha. I bought this piano as a means to find out whether I liked piano playing. That meant it had to have a bare minimum of sound and feel resemblance of a real piano. Sound has to inspire, touch has to give you the ability to express yourself. As for sound, the speakers are ridiculous, but the tones themselves are 'bare able' as you can find out with headphones. So that was ok.
Playable? Yes, and arguably for professional players as well I think. But now that I have this keyboard for a few years, I consider myself a novice, I find a lot cords, where your fingers get between the black keys, very difficult to play. And it has to do with the length of the keys, the pivotal point, which influences the attack. The closer you get to the end of the key it becomes heavy and very hard to play (for a beginner, a professional can pull through,as ever). This makes me look for a new piano now, because it really starts to annoy me. I'm not sure if hammer action technique cancels out this problem (which is basically a different technique altogether). Still, for a beginner,I think a good choice, if you find out you don't like piano playing, no harm done.